A beautiful 5 bedroom/3 bathroom 2 story villa with large south facing pool and spa fenced for privacy. 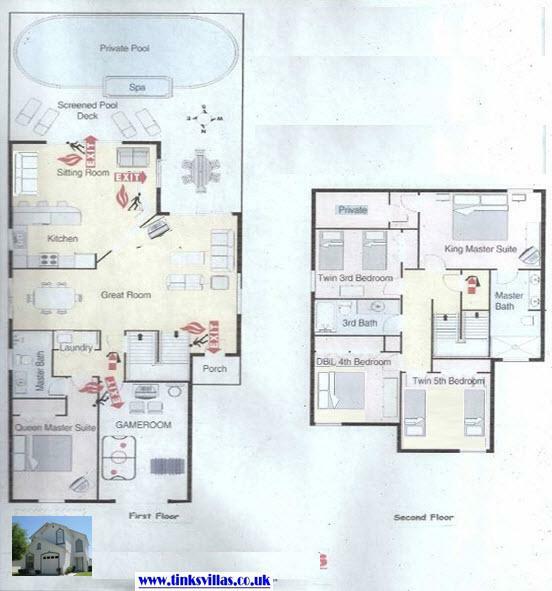 Two master en suites so it is ideal for 2 families sharing. Fully air conditioned & equipped with all you need to enjoy your stay in Florida. Wonderful 5 bedroom villa set in a small, secluded, quiet gated community in Kissimmee, which is just off highway 192 and is close to hundreds of shops & restaurants (some are within walking distance) and a short drive to theme parks. Why be cramped in hotel rooms when you can have the luxury of a villa with full air conditioning, 2 master suites, TV room & separate sitting room, games room, large south facing private pool & spa and extended pool deck. All bed linens & towels including pool towels are provided so just bring yourselves & lots of energy! TV Lounge - large family room with 2 large comfortable leather sofas, ceiling fan, Cable TV & DVD player(selection of films provided) and Xbox 360.. Dining Area To the left of the family room is the formal dining area with large table & seating for 6. Plenty of crockery & cutlery incl plates & beakers for use outside. A cool bag is provided for days out. The sitting area has 2 comfortable sofas, a CD player with a selecion of cds and a selection of books & games. Master Bedroom - the large master bedroom is located on the 1st floor. The room has a king size bed, Cable TV, ceiling fan & walk in closet. The en suite bathroom has his & hers vanity sinks, hairdryer, WC and bath with shower over. 2nd master suite - located on the ground floor and is ideal for parents/grandparents wanting a little privacy. The room has a queen size bed, Cable TV/DVD combi, ceiling fan and closet. The en suite bathroom has sink, hairdryer, WC & bath with shower over. Bedroom 3 - Winnie the Pooh Queen room with walk in closet, dresser, side drawers, ceiling fans and soft toys. Bedroom 4 - Scooby Doo twin room has a unique handmade Mystery Machine bed and a giant Scooby Doo, walk in closet, drawers and ceiling fan. Bedrooms 3,4 & 5 share the house bathroom which has bath with shower over, wc, vanity sink and hairdryer. Lanai - leading from the kitchen/sitting room is the covered lanai with ceiling fan and table & chairs - relax over breakfast whilst planning the day ahead. Pool area - The large south facing pool area can be accessed from the lanai or the sitting room and has a large deck area with sun beds and chairs. The large pool & spa can be heated at an extra charge(pool heat recommended between Oct & Apr). This is a wonderful place to relax after a busy day at the parks or for a fun/rest day between parks. The pool area is screened and fenced for privacy. The Hamlets is a quiet gated community of just 51 houses - part residential/part rental & no further building work is taking place. 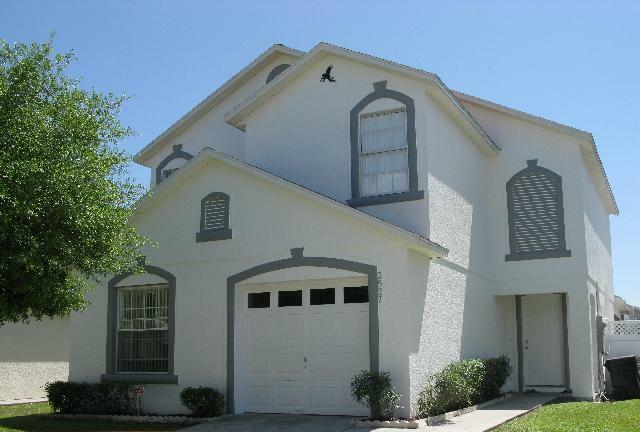 It is located at the end of a quiet lane just off highway 192 in Kissimmee which has everything you need. There are just too many restaurants and shops to name but you will find something for everyone and some are within walking distance. Disney is appx 10-15 mins drive, Seaworld 20 mins and Universal Studios 25-30mins. Fancy a day at the beach - West coast appx 1 hr and East coast (Kennedy Space Centre) around 50 mins.